Felt hats are great to add a stylish touch to your winter wardrobe. 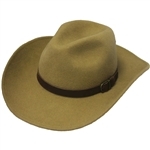 Fedoras, gambler and outback cowboy hats in wool or felt are classic and perfect for the modern gentleman. 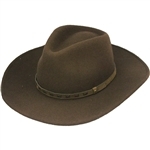 A wool western hat is a great economical alternative to a leather cowboy hat, you are sure to find the perfect style western hat at Leather Bound. 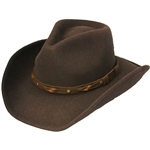 Many of our genuine wool cowboy hats are made here in the USA and include decorative hat bands. Wool hats are great for travel as many can be easily folded and packed in luggage.